The reference orifice is located inside the canister pump module. 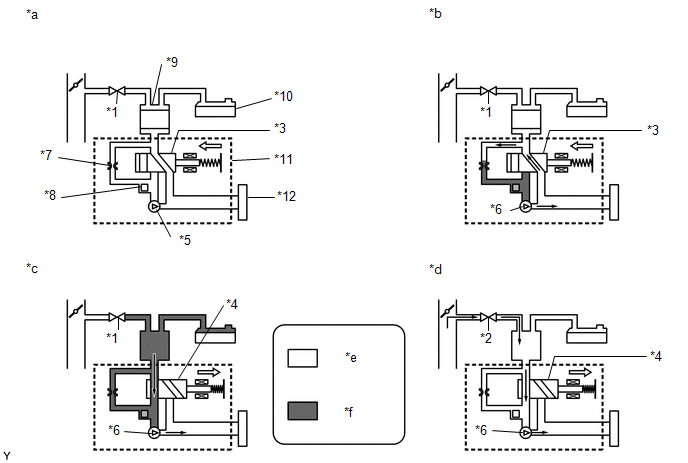 The description can be found in EVAP (Evaporative Emission) System (See page ). Activated by soak timer, 5, 7 or 9.5 hours after ignition switch turned off. Vent valve is turned off (vent) and EVAP system pressure is measured by ECM in order to register atmospheric pressure. If pressure in EVAP system is not between 70 kPa(abs) and 110 kPa(abs) [525 mmHg(abs) and 825 mmHg(abs)], ECM cancels EVAP system monitor. In order to determine reference pressure, leak detection pump creates negative pressure (vacuum) through reference orifice and then ECM checks if leak detection pump and vent valve operate normally. Vent valve is turned on (closed) to shut EVAP system. Negative pressure (vacuum) is created in EVAP system, and EVAP system pressure is then measured. 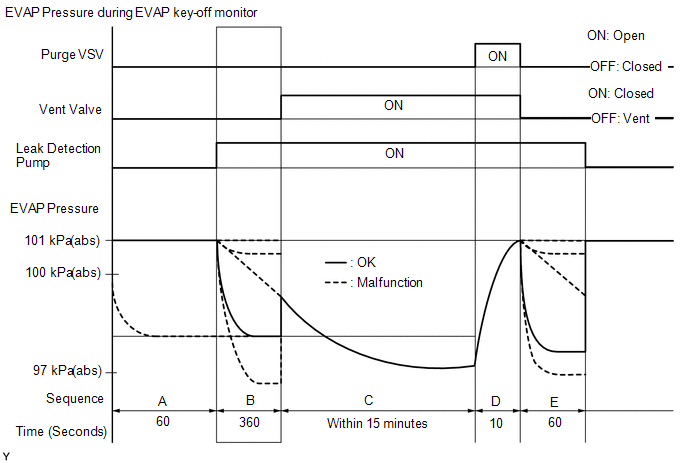 If EVAP pressure does not stabilize within 15 minutes, ECM cancels EVAP system monitor. Purge VSV is opened and then EVAP system pressure is measured by ECM. After second reference pressure measurement, leak check is performed by comparing first and second reference pressure measurements. If stabilized system pressure is higher than second reference pressure, ECM determines that EVAP system is leaking. Atmospheric pressure is measured and then monitoring result is recorded by ECM. The leak detection pump creates negative pressure through the reference orifice (in operation B and E). When the system is normal, the EVAP pressure is between 97 to 100 kPa(abs) [726 to 750 mmHg(abs)]* and saturated within a minute. If not, the ECM interprets this as a malfunction. The ECM illuminates the MIL and stores a DTC if this malfunction is detected in consecutive drive cycles. "Saturated" indicates that the EVAP pressure change is below 0.286 kPa(gauge) [2.145 mmHg(gauge)] in 60 seconds. When the temperature of the fuel is 35°C (95°F) or higher, a large amount of vapor forms and any check results become inaccurate. When performing the Evaporative System Check, keep the fuel temperature below 35°C (95°F). Enter the following menus: Powertrain / Engine / Utility / Evaporative System Check / Automatic Mode. After the Evaporative System Check is completed, check for All Readiness by entering the following menus: Powertrain / Engine / Utility / All Readiness. Input the DTC: P043E, P043F, P2401, P2402 or P2419. Refer to EVAP System (See page ).